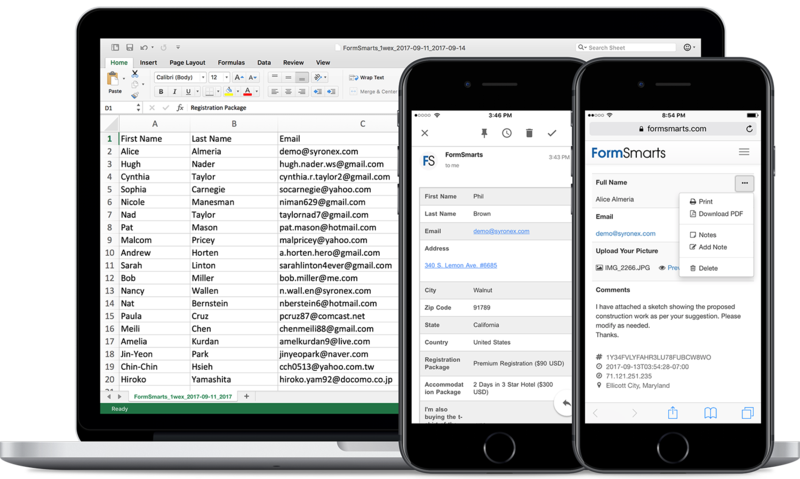 FormSmarts is an online form builder and cloud-based web form platform providing all you need to create a form and publish it in minutes. Making an online form with FormSmarts is quick and easy. Our interactive form builder allows you to create a form in minutes. We don't limit the number of forms you can build — and our basic service is free. FormSmarts is a full-featured online form platform that seamlessly integrates with PayPal so you can accept credit card payments on your forms and supports form attachments allowing users to upload pictures and documents on a form. Explore other features and create your account to get started today. FormSmarts makes it easy to embed a form into any website using the HTML code snippet provided by the form builder. Each form conveniently comes with its own FormSmarts.com URL, so you can share it on Facebook, Twitter and anywhere you can post a link. That's also the best way to send a form by email. 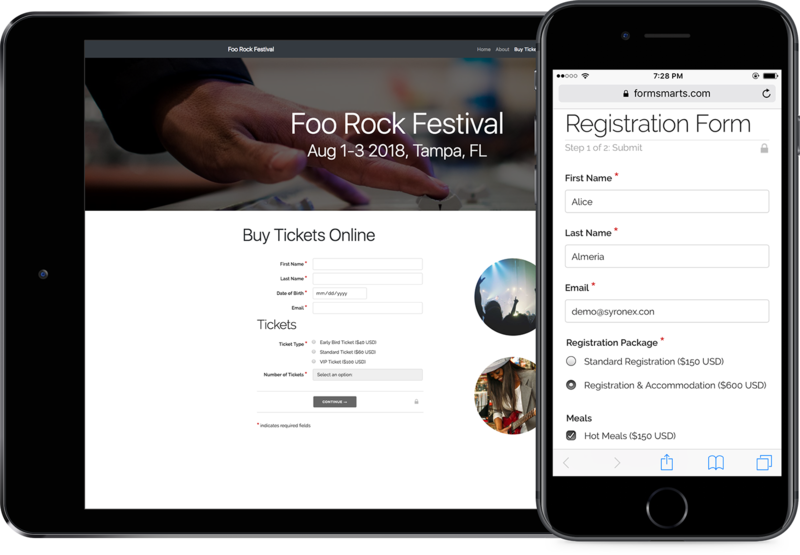 FormSmarts identifies visitors accessing a form with smartphone or tablet and displays a mobile form optimized for touch screen devices. Each form also has its own shortened URL and QR code so you can easily integrate it to printed media. When someone submits a form, we email a copy of the form response to each recipient. FormSmarts has built-in form validation and offers world-class form spam protection, so you only get the form submissions you want, not spam. When you create an online survey or registration form, you usually want to collect form submissions on FormSmarts, rather than having each one emailed to you. You can then export form responses as an Excel/CSV spreedsheet in a few clicks with our reporting tool. FormSmarts also allows you to view submitted form data online or download a PDF report for individual form submissions. Integrate your website, database or any web app with the FormSmarts platform using our web API. With the Webhook API, you can set FormSmarts to send machine processable ‘push’ notifications to your website, allowing you to process the information submitted through an online form automatically and in real-time. FormSmarts can post part of the information submitted through your online form to Twitter according to a predefined template. This allows you to harness the power of social networks to engage your user community, for example when signing up delegates for an events. You can also get condensed form responses by Twitter Messages. How can I put a form on my site? Simply grab the code for our popular online form widget from the Forms tab of the Form Builder. You can integrate a web form anywhere your can paste HTML, including on platforms like Wordpress. Each form also has its own FormSmarts.com URL you can link to. Can forms include a payment? FormSmarts' popular PayPal Form feature makes it easy to add a PayPal payment to a form, while giving you the power and flexibility of a full-featured form builder. With both a Standard and an Advanced PayPal Integration system, FormSmarts is your best option whenever you need to collect data and get a payment on a form. How do I get form reponses? You can get form submissions by email (plain-text or rich-text format, to multiple recipients), view each form response online or download a PDF, get an Excel spreadsheet with aggregated form responses, or even get condensed form submissions by Twitter Messages or have form excerpts posted to Twitter. Do you have demo forms I can try? We've built a number of example forms that you can try out: a feedback form using basic input fields, an online survey form featuring all types of input fields, and a file upload form. We've also created several payment forms that integrate with PayPal. Can I embed a form into Facebook? Yes. Visit the Form Publishing Options screen of the Online Form Builder to get a code snippet and instructions to integrate a form into Facebook. You can also simply post your online form's URL on Facebook. How is FormSmarts different from other online form services? FormSmarts integrates all form processing components — form builder, form processing backend, cloud storage, unobtrusive form spam protection, payment integration — so you can create online forms in the fastest and easiest possible way. Can I create any kinds of forms? Yes. FormSmarts supports the whole set of HTML from controls: one line & multi-line text box, drop-down list, radio button, and check-box. We've also added other useful widget: a date picker, a geo-localized country selector, a checkbox list control, an inline agreement/waiver viewer and an electronic signature widget. Do you host online forms? Yes, we hosts forms on our cloud. That means you don't even need to own a website to enjoy web forms. With a simple link, you can let anyone access your form from Facebook, Twitter, or by email. You can even use the form's short URL in printed material. Of course if you do have a website, you can also embed the form on your site or Facebook. Do I need to know HTML or web site design to get a form? No. We provide a visual online form builder that allows anyone create a form in the easiest possible way, without any need for web design or technical knowledge. Can I customize the style of a form? The online form builder allows you to choose the layout and colors of your forms. You can also fully customize the look & feel of a form by providing your own CSS stylesheet. FormSmarts offers three plans: a free tier, our basic Pro package that only costs $50/year and our Business package. Business is our business-grade online form service, for users who need a rich set of features, a high resource quota and personalized support. Business is available in several levels depending on your needs; Business Starter, Business Plus, Business Max and Business Premier. Business Starter offers a selection of our most popular features for just $120/year. Find out more and compare packages. Can I build forms in any language? Yes! And when you make a form with FormSmarts, default confirmation messages, buttons, etc. can be viewed in 29 languages. Who's using FormSmarts for their forms? Our clients range from government agencies, universities, and large companies down to professionals, bloggers, and individual web users. FormSmarts also serves a large number of non-profits.